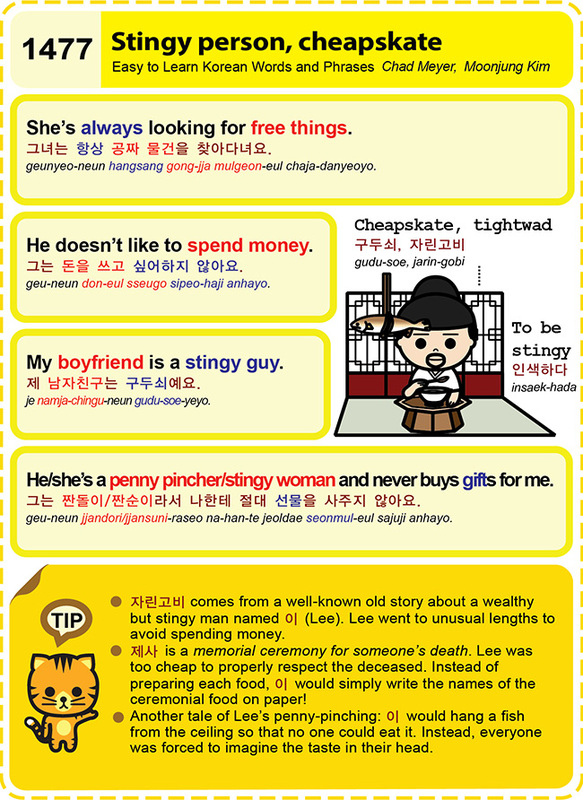 Easy to Learn Korean 1477 – Stingy person, cheapskate. This entry was posted in Series and tagged avoid spending money, cheapskate, hang fish from ceiling, He doesn’t like to spend money., He/she’s a penny pincher/stingy woman and never buys gifts for me., imagine, Lee, memorial ceremony for someone’s death, My boyfriend is a stingy guy., penny-pinching, She’s always looking for free things., stingy, stingy person, tightwad, write the names of the ceremonial food on paper, 구두쇠, 그녀는 항상 공짜 물건을 찾아다녀요., 그는 돈을 쓰고 싶어하지 않아요., 그는 짠돌이/짠순이라서 나한테 절대 선물을 사주지 않아요., 이, 인색하다, 자린고비, 제 남자친구는 구두쇠예요., 제사 by easykorean. Bookmark the permalink.